Running in winter can be an invigorating experience; full of bright sunshine, clean, cold air, dedicate running companions. It can also be a miserable, exhausting mix of sleet, extremely poor footing, short periods of daylight, and streets and sidewalks narrowed by piles of frozen mess. Which leads me directly to the treadmill at the gym. 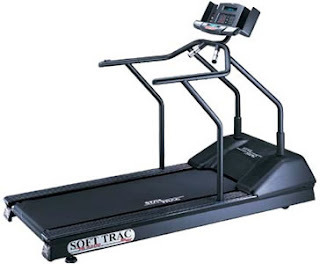 When it's snowing hard, or this winter, raining, more often I have been choosing to run on the treadmill rather than run outside. Last winter when training for the marathon last year I rarely ran on the treadmill. The runs were longer and spending all that time on a treadmill wasn't worth it. But this winter I'm not as motivated to suffer outside so I end up downstairs. The gym has a couple of nice modern treadmills (and a few crappy old leg breakers) with a lovely view of the parking lot. At least once a week I head down there, pop my headphones on, and spend 30-50 minutes staring alternately at the lights in the parking lot and the glowing red LEDs of the display. No TV at the work gym. My chief entertainment is singing along with my music and calculating the next fraction of my remaining run. Math is fun. I usually determine how far I will run based on how I feel after the first mile; I rarely have a definite goal in mind. I'm sure there are more pros and cons, but frankly, one run a week on the treadmill doesn't warrant that much thought. The workout is still good, and the mileage still counts, so I run and try to get through the boredom and think of longer, warmer days.